Ross Perian has risen above his social standing in a third-world country and settled in the United States, where he built a life he never thought possible. But how did Perian, who today serves as chief information officer of Superior Industries International Inc., do it? At an early age, Perian learned from his father that a successful life entails knowledge, service, and continuous improvement. “What brought me to the United States was the mentality of the average American who just believes in themself and self reliance, fierce independence, personal freedom, and a small government that doesn’t interfere with every aspect of your life,” Perian says. Profile caught up with Perian to learn more about these values, and what drives him in his job every day. Perian grew up in a low-income, Armenian-Christian minority family in the predominantly Muslim Tehran, Iran. “Education is huge in our culture, especially higher education,” Perian says. “It’s encouraged to get the best education possible.” Believing in himself, Perian knew that there was a better place for him to start his career, and he decided to travel to England in 1975 to pursue his bachelor’s degree in Industrial Engineering at the University of Hertfordshire, in Hatfield, England. The program required fluency in either German or French; choosing the former, Perian found himself in Germany for industrial-engineering training. In 1982, Perian graduated with honors and received special recognition for being the first foreign student to be honored for this accomplishment. Perian’s education differed distinctively in both countries. His English experience focused highly on brainstorming, innovation, and the pursuit of new and exciting ideas. In Germany, the sense of urgency, excellence in execution, and a high level of automation were key principles. “The combination of English innovation and German automation and manufacturing excellence is a powerful recipe for success,” Perian says. And, as he started looking around the globe, it became apparent very quickly that the country he could identify with, that aligned with his value system and his work ethic, was the United States. Shortlythereafter, Perian’s thirst for knowledge drove him to California State University, where he received his MBA. Continuous improvement is a vital part of Perian’s genetic makeup. “Every business is about making a profit and continuously improving profitability, because, if you’re not, then you will not be in business for long,” he says. Starting in 1983, Perian started using information technology as a critical tool to gather and analyze data to help with the identification of cost-improvement opportunities. Before Perian made his debut at Superior, he worked for Beckman Instruments, Emerson Electric, Boeing, and Discount Tires. His earlier career with Emerson Electric as a cost-improvement manager further enhanced Perian’s skills and abilities to improve all business-cost components—from manufacturing processes to administrative functioning. Perian’s previous positions at Boeing and Emerson Electric gave Perian the opportunity to set up his own information-technology department to address the needs of both operations. During his tenure at Boeing, Perian delivered significant process improvements and cost reductions. Perian later decided to take on a position at Discount Tires as a career challenge, because he wanted to see if he could utilize his skills in other industries. 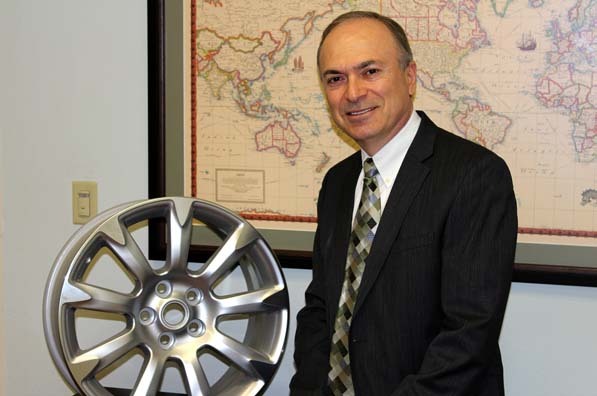 Perian notes that these experiences prepared him for his biggest IT career at Superior, one of the largest original-equipment manufacturers of aluminum wheels for passenger cars and light trucks in North America. Superior, headquartered in Van Nuys, California, has five plants in both the United States and Mexico. The most important job of the CIO, according to Perian, is to provide the best service to the business and to do what you need to have competent employees. His main responsibility at Superior is to provide a secure and stable IT environment for users in various functional areas. Perian is also responsible for helping operations become more efficient, by reducing cost and improving quality. Perian’s objective is to continuously drive down costs in a business. Superior’s IT budget is now about a third of the industry and yet the team still achieves the goals and objectives of the company’s internal and external customers. Under Perian’s leadership, all of Superior’s IT functions have consolidated into one cohesive department. Superior now has a standardized enterprise-resource-planning system, an electronic-enterprise-asset-management system, a human-resources-information system, and an electronic-data-interchange e-mail system (all of which was accomplished while streamlining office productivity). “My greatest professional accomplishment has been to continuously provide employers a great value for their money,” Perian says. “I have to know that, for every day that I get paid, I go home knowing that I gave my all to the business and helped them become more successful.” By all accounts, Perian has been able to accomplish this objective, which is higher-level customer service at significantly lower cost. Perian explains that no one can quite quantify in dollars and cents what that means, but one can imagine it’s in the millions of dollars.